Somehow, today is the first day of August and not only does that signify the beginning of the end of summer, but also Back to School! And with Back to School comes the need to raise group funds for field trips and uniforms and sports equipment and the like. Daffy Farms would love to be a part of your fundraising effort! Whether you are located near or far, we have several options available, described further below and on the Fundraising Information page on our website. Available from September 1st through November 15th. Potential profit of $20-$32 per case when sold at the suggested selling price of $1.50-$2.00 per each Petite Caramel Apple. 24 individually labeled and packaged Petite Caramel Apples per case. 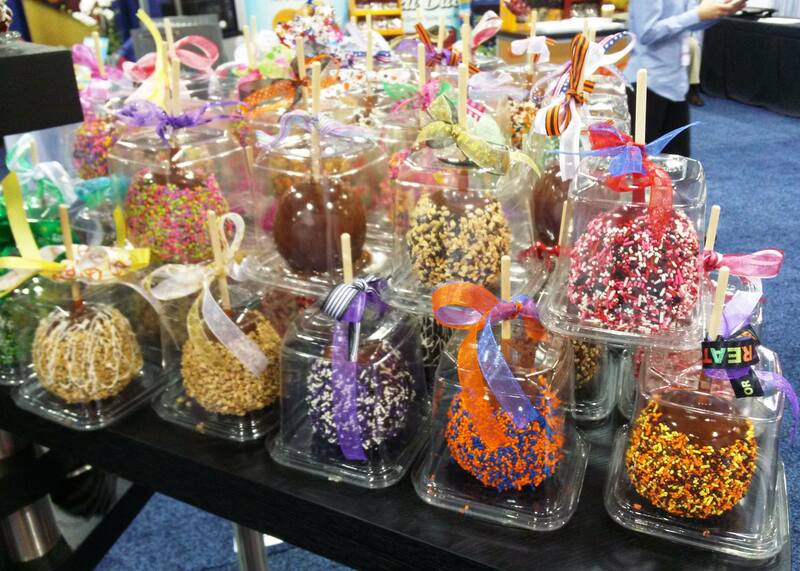 Petite Caramel Apples with Crunch, Petite Red Candy Caramel Apples with Crunch and Petite Caramel Apples with Peanuts may be available at a discount price. Please contact us for more information. Orders require 2 business days for processing. Pick up anytime between 8am and 4:30pm Monday-Friday at our factory location. Payment is due at the time of pick up and may be made via a school or organization check, Visa, Mastercard, Discover, AMEX, cash, or school purchase order. 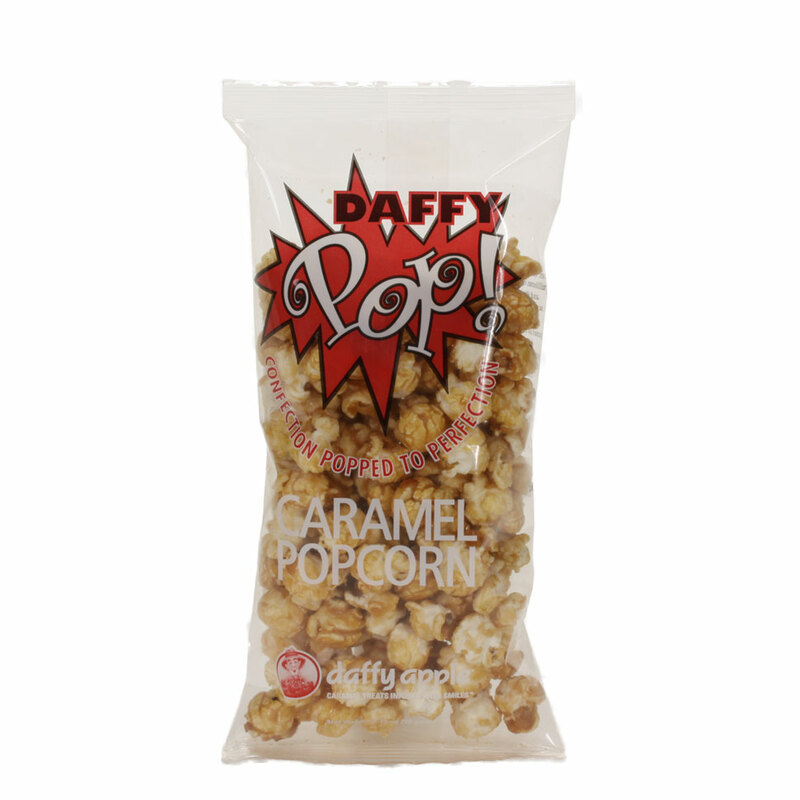 Potential profit of $36 per case when sold at the suggested selling price of $2.00 per each bag of Daffy Pop. 36 individually labeled and packaged 2.75oz bags of Daffy Pop per case. Daffy Pop may be available at a discount price. Please contact us for more information. Orders require 7 business days for processing. 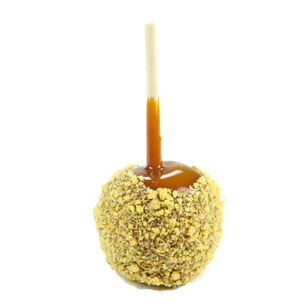 Caramel Apple Kits come with enough caramel, topping and sticks to make anywhere from 15-600 caramel apples. 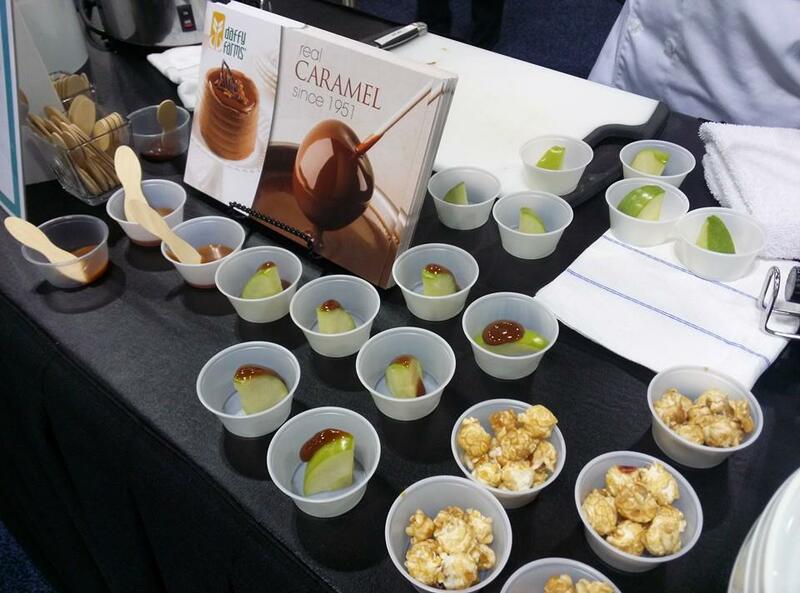 Potential profit varies by kit size with the per finished caramel apple price starting at $0.42 each. 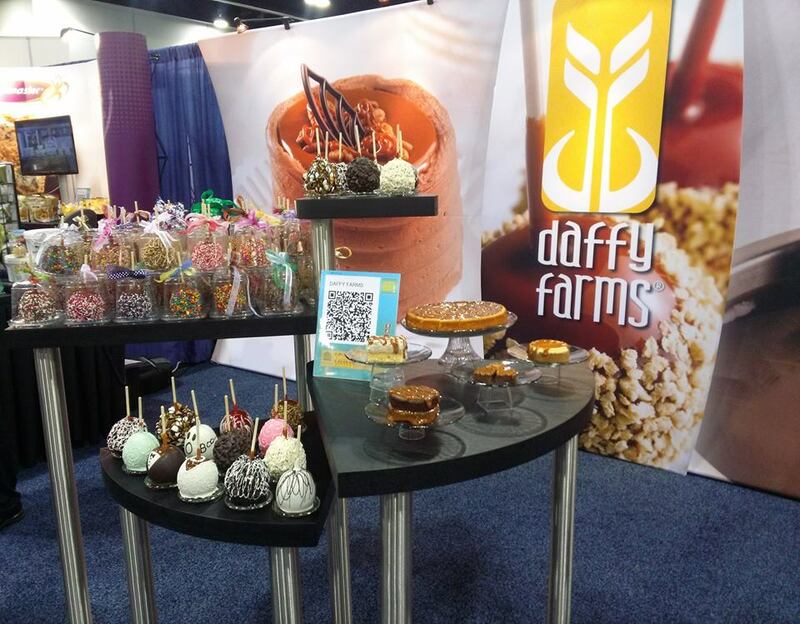 Daffy Farms ships products all across the country, however shipping costs do make the potential profit earned from our Petite Caramel Apples and Daffy Pop very low. 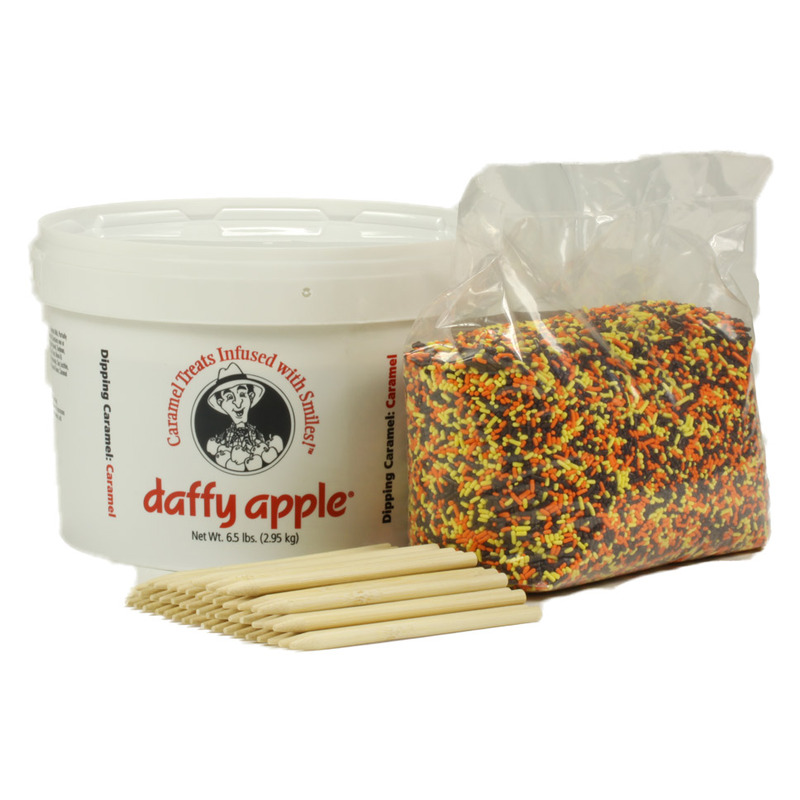 Daffy Apple Caramel Apple Kits are a good option due to their lower shipping costs and often local businesses will donate apples. Please contact us for more information on fundraising options. Posted in Caramel Corn, Daffy Farms, The Daffy Apple and tagged back to school, bulk caramel, caramel, caramel apple, caramel apple kit, caramel apples, caramel corn, caramel popcorn, carnival, crunch, daffy apple, daffy farms, event, fall, fundraiser, fundraising, group, individual, nonprofit, popcorn, school, traditional on August 1, 2014 by daffyfarmsblog. Q&A Tuesday: Do you ship to Florida, Arizona, Alaska, and Hawaii? Yes! 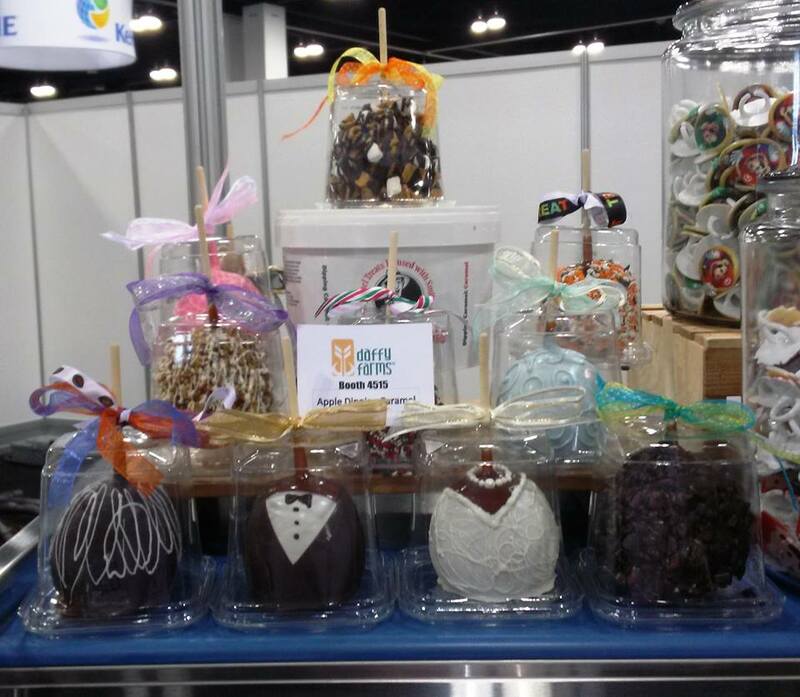 We ship all of our Bulk Caramel, Caramel Apple Kits, Caramel Apples Supplies, Caramel Apple Equipment, and Caramel Corn to all 50 states in the U.S. We cannot ship Petite Caramel Apples or Premium Caramel Apples to Florida, Arizona, Alaska, and Hawaii. If you live in one of these four states and would like to place an order for products we can ship to you, please contact us by phone to place your order. Posted in Bulk Caramel, Caramel Apple Wedding Favors, Caramel Corn, Daffy Farms, Q&A Tuesday, The Daffy Apple and tagged alaska, arizona, bulk caramel, caramel, caramel apple, caramel apples, daffy apple, daffy farms, delivery, event, fall, florida, hawaii, Q&A Tuesday, shipping on June 10, 2014 by daffyfarmsblog. 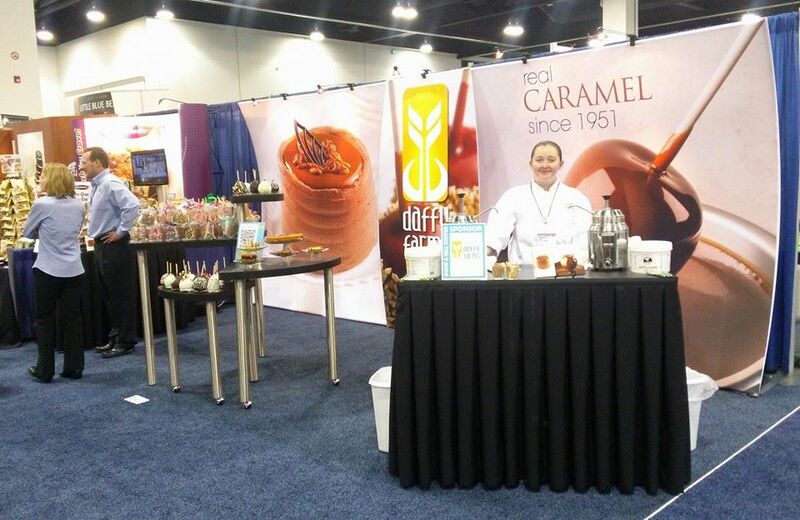 This time last week we were right in the middle of the IDDBA Dairy-Deli-Bake Seminar and Expo 2014! 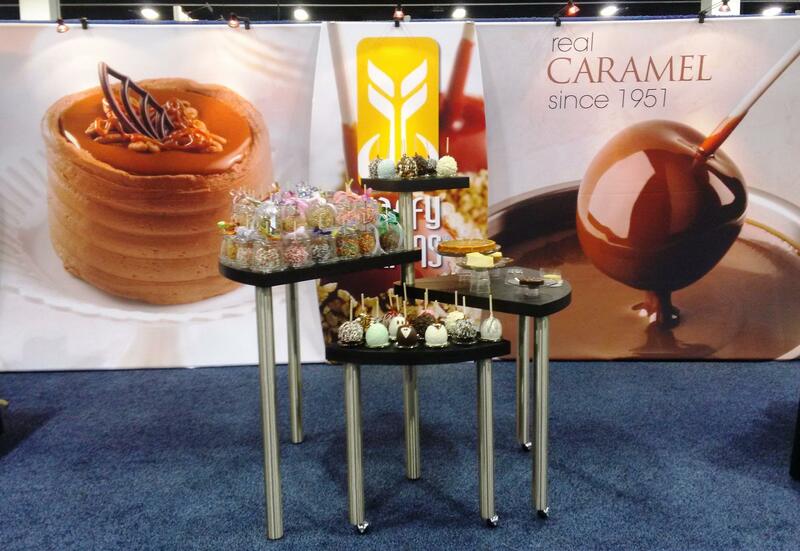 Our goals for the show were to introduce our new products, Daffy Farms All Natural Baker’s Caramel and Daffy Farms All Natural Dipping Caramel, as well as to promote our classic recipes, Daffy Apple Traditional Dipping Caramel and Daffy Apple Red Candy Dipping Caramel to top grocery store bakeries, dessert manufacturers, and product distributors. The show was an overwhelming success and an invaluable experience, from the interest in our products to the industry connections to the distinguished guest speakers to the copious amounts of cheese samples! We also snapped a few photos along the way, so we could share our experience with you . . . .
Fall is our busy season, when apples are harvested and delivered to us fresh from orchards, but we stay plenty busy the rest of the year, too! The spring and summer months are when we test new products and perfect old ones. This year, that includes testing out some new caramel popcorn recipes and redesigning packaging to better fit our new image and branding as Daffy Farms. 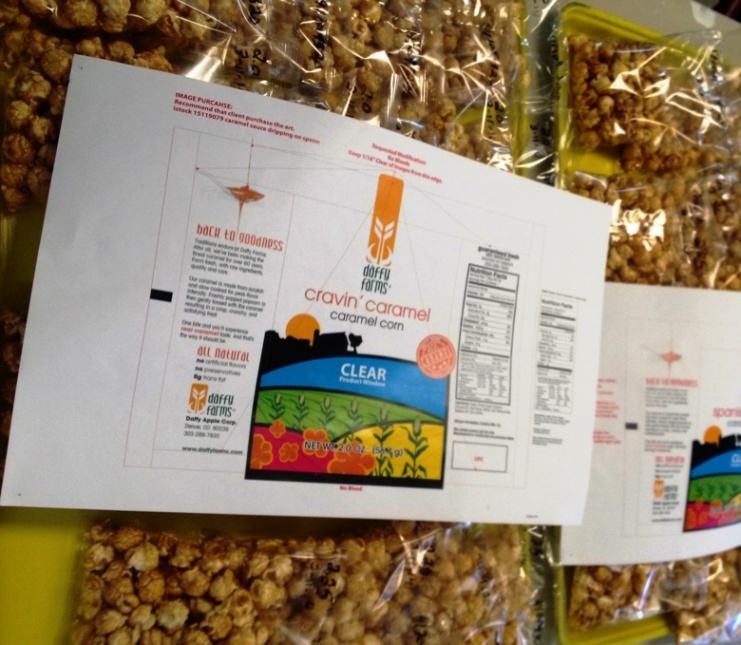 The picture to the left shows a draft of one of our new caramel popcorn packages as well as sample bags of our new recipes of all different weights and sizes. 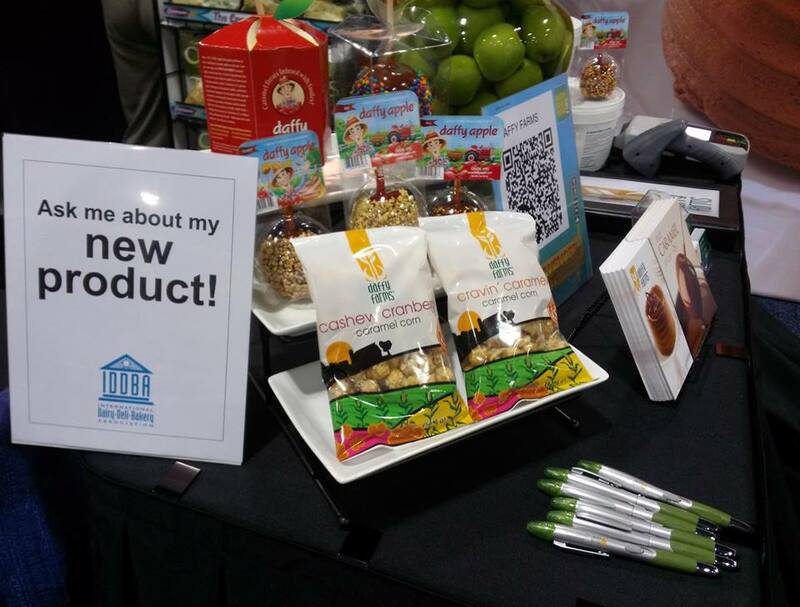 We hope to have the new packaging available for retail sale in June! Posted in Caramel Corn, Daffy Farms and tagged all natural, caramel, caramel corn, cashew, cranberry, daffy farms, new, package, packaging, peanut, popcorn on May 7, 2014 by daffyfarmsblog.